There are two reports to show the status of multiple Satellites at once: The All Satellites Summary, and the All Satellites Status. You can switch between these two reports via the two links in the grey bar above the blue title bar. These reports are accessed by clicking on the SATELLITE SERVERS node in the Satellite Services category on the left of the Console. 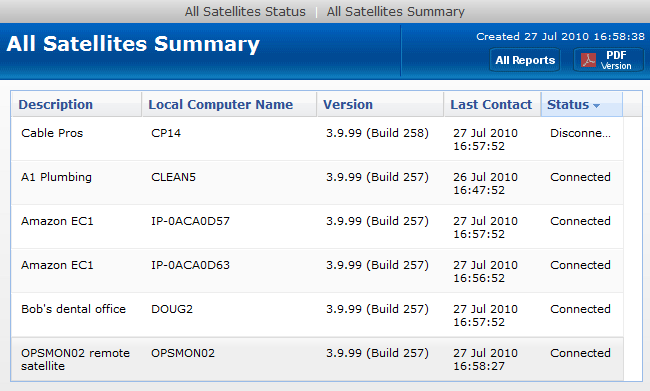 This report lets you quickly see the status of all of your remote Satellite Monitoring Services, and easily shows if they are all on the same software version (sort by the Version column to quickly find Satellites with different versions). This report uses the familiar metaphor of showing each Satellite as a separate box. The color of the box indicates the Satellite's connection status (green = connected, yellow = disconnected). Disconnected Satellites will automatically float to the top to draw your attention to them.